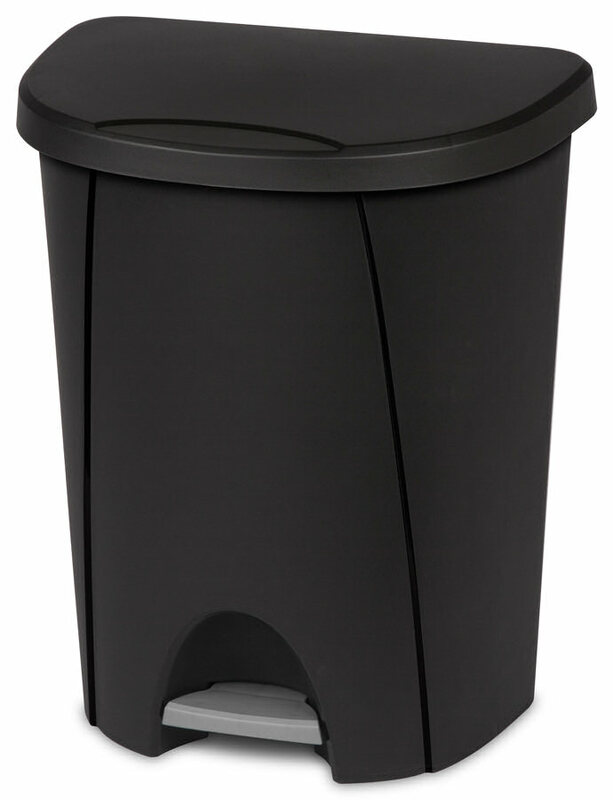 The 6.6 Gallon StepOn Wastebasket is ideal for smaller spaces and is great for use in the kitchen or office. It is designed with a textured finish and polished accents. The space-efficient D-shape base allows it to fit closely against the wall making it ideal for high-traffic areas. The lid opens easily by stepping on the foot pedal for hands-free access then closes tight to keep waste and bag concealed. The lid also helps hide contents from sight and keeps odors contained. 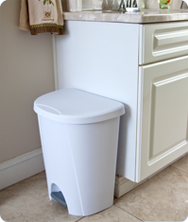 A standard 8 gallon trash liner fits snugly on the specially designed rim. 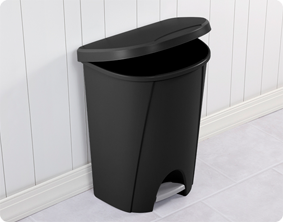 The overall dimensions of this item are 15 1/4" L x 11 3/8" W x 18 1/2" H.
Overall Assembled Size: 15 1/4" x 11 3/8" x 18 1/2"
D-shape wastebasket fits nicely against a wall or cabinet. Ideal for bathrooms and office spaces in the home. 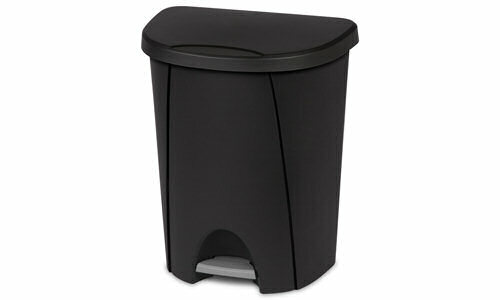 6.6 Gallon StepOn Wastebasket is rated 5.0 out of 5 by 1. Rated 5 out of 5 by braids from Like Goldilocks says "It's just right" I was looking for a covered trash can for the bathroom. I wanted a flat backed or rectangular can because I have a deep narrow bathroom. Everything I found was either too tall, too tiny, took up too much space, or was too expensive. After months of searching at several retailers I found this one. I thought "Well this will have to do - it's better but a bit on the large side." What I discovered when I brought it home was it took up the same space as a smaller can that I had with a swing lid because that one slanted out at the top. This one opens nicely, it's not wobbly, there's a big enough space to get your toes in to operate the lever, the lever doesn't stick out creating a trip hazard, etc. I use a 13 gallon drawstring bag in it and it stays in nicely. This would work great in many places and would be a good choice for an RV/camper, sewing/crafting space, or if you're a vendor and need a can in your booth. Not too big and not too small and keeps your hands free. Win win win! Like Goldilocks says "It's just right"!